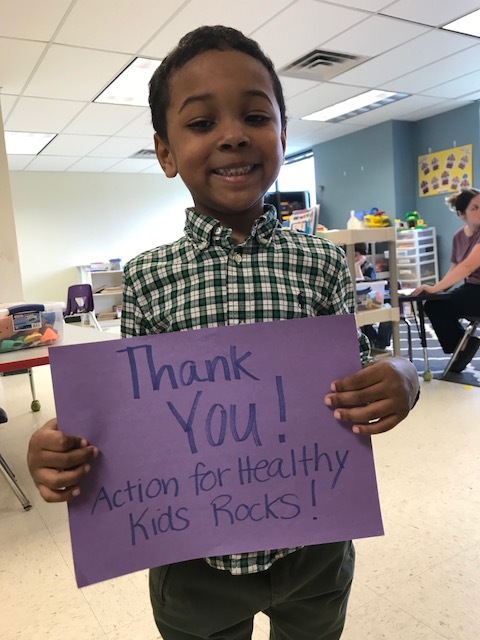 Thanks again to Action for Healthy Kids! Crossroads Center for Children has received another installment check from our $1,000 GO grant this week. 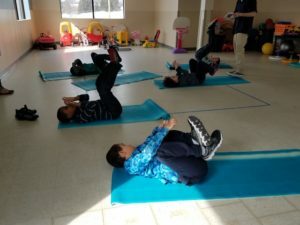 Readers have seen posts about our Physical Education and active supplies this year and the fun activities our students are engaging in this year. This installment of $250. will help us further update and enhance offerings for physical activities for our students. THANKS SO MUCH! In early May, we’ll be hosting a celebration of Every Kid Healthy Week, as part of our requirements for this grant. It will also integrate our Healthy Food Program end of year celebration! We are going to invite our parents in to join our students and staff in a Lap Walk of our parking lot perimeter. This will lead into a Healthy Food Program table, offering healthy snacks upon completion of the laps that each classroom will set as their own goal. This grant has gone to PE and motor skills supplies, such as yoga mattes, color coded soccer balls, hoops, nets, and more. Super Hoopers in Room 5! 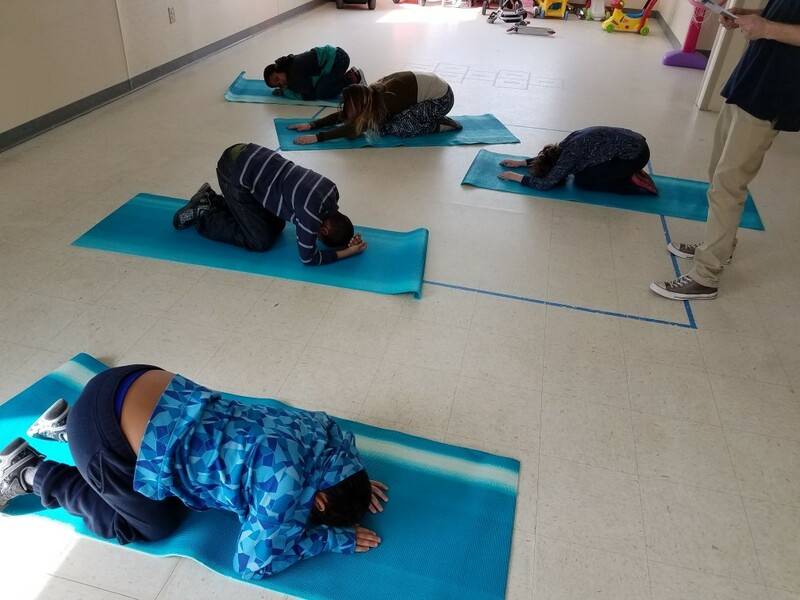 Thanks to Action for Healthy Kids, Crossroads Center for Children will be able to update and enhance offerings for physical activities for our students. The proposal budget for this project consists of items for Physical Education classes and fitness activities for indoors and outdoors, such as an outdoor basketball hoop, soccer goals, and balls. The funding will benefit student health and wellness, with a further impact on Social Skills development, which are both constant areas of programming implemented at the school. New wonderful items will be added to our current supply repertoire, available to all classrooms and therapists, as well as classroom-specific supplies to the extent that the funds allow. Other aspects of this grant require that we conduct some specified activities in addition to spending the money, and these activities are aligned with our program mission of preparing children for life success. We have established a school health team that will plan a family-friendly health-promoting event during April to celebrate Every Kid Healthy Week. If you are interested in helping with this we want to hear from you! We’re honored to announce that we have a new grant on the way! We want to share this great news for our school. Action for Healthy Kids has recently announced its 2018 selection for Game On grant recipients. This is the first application from Crossroads Center for Children, and we are thrilled to be on the list! This funding will be coming to us soon, and will help us to purchase much-needed Physical Education Equipment. Being a part of the Action for Healthy Kids network also gives us a wonderful opportunity to plan and implement some new ideas for healthy activities throughout the year for our students and families. Visit the Action for Healthy Kids website for more information and Game On for ideas and tips on creating healthy schools and communities. Stay tuned to our website for more information on this exciting new grant as the funding is received!